You, sir, are not the kind of go-getter we want as a paperboy for the Evening Star. Oh, no! 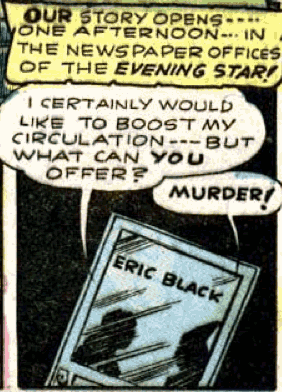 It just clicked that the dude offering murder to Eric Black is wearing a pointy hat! I realize it’s suppose to be the wizardish dude from the other panel, but the silhouette looks like a Klansman.